Get the most out of your suspension upgrade by making adjustments to improve the quality of your ride. 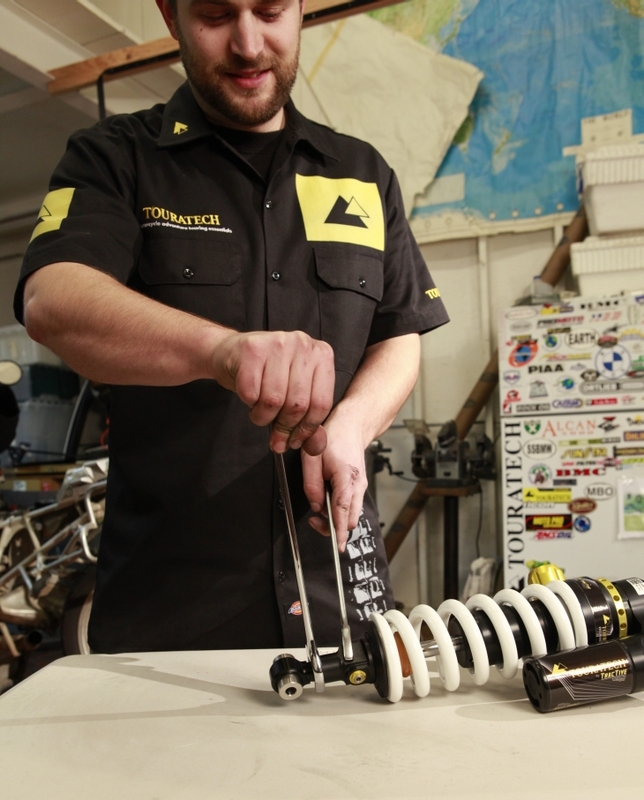 Here are a few tips for how to adjust your Touratech Suspension shocks. 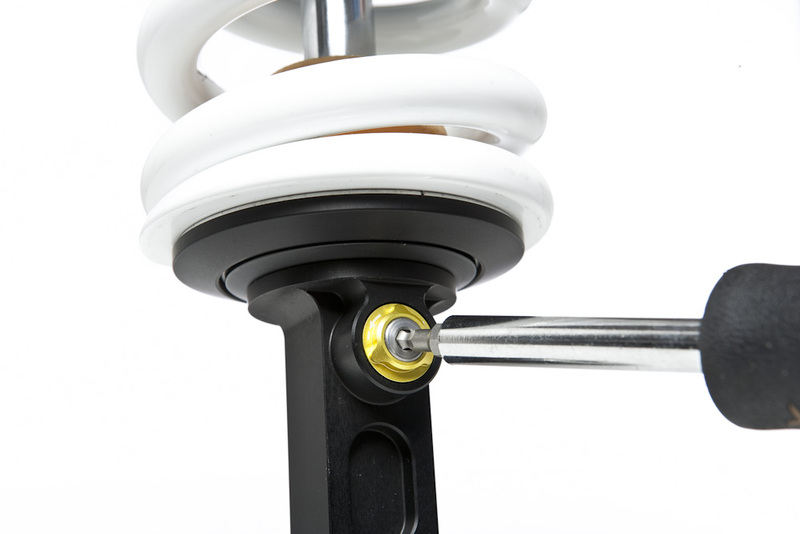 Twist the large yellow knob marked +/- to increase or decrease the preload force on the shock spring. This adjustment should be made to bring the bike back to level after adding the rider and his or her gear & cargo. As you add more weight to the bike, you’ll need to increase the preload adjustment to keep the bike level when riding. When you add more weight to your motorcycle, measure the suspension SAG and turn the PRELOAD adjust knob clockwise until the suspension SAG is correct. Click HERE to learn more about setting the correct sag on your motorcycle. 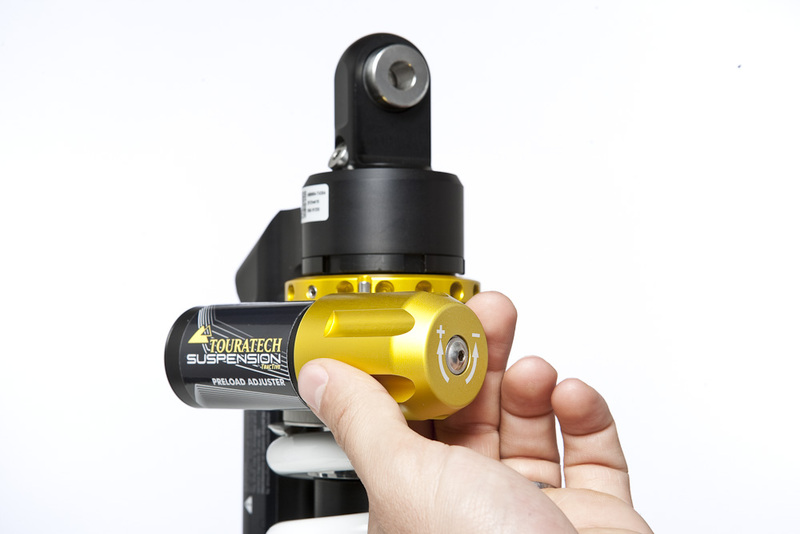 Note: If you have the Explore shock, turn the yellow threaded spring collar to adjust preload. This adjustment changes how quickly the shock extends back to its full-length after being compressed by a bump. The rebound adjustment can be used to change how much the bike bounces after hitting a bump in the road. If you feel like the bike bounces the rider into the air after hitting a bump (like a pogo-stick) then increase (or slow) the REBOUND damping by turning the screw clockwise a few clicks. If you feel like the suspension does not extend back to full height quickly enough between closely spaced bumps (“packing up”) and gets too hard as a result, you should reduce (or speed up) the REBOUND damping by turning the screw a few clicks counterclockwise. This adjustment changes the oil resistance in the shock for very quick suspension compressions. The high-speed adjustment can be used to change how the bike absorbs washboard bumps, embedded rocks, or other choppy road conditions. If you feel the bike is too harsh when riding over washboard bumps, embedded rocks, or freeway expansion joints you should reduce the HIGH-SPEED compression by turning the screw a few clicks counter-clockwise. If you feel the bike is too soft, increase the HIGH-SPEED compression by turning the screw a few clicks clockwise. 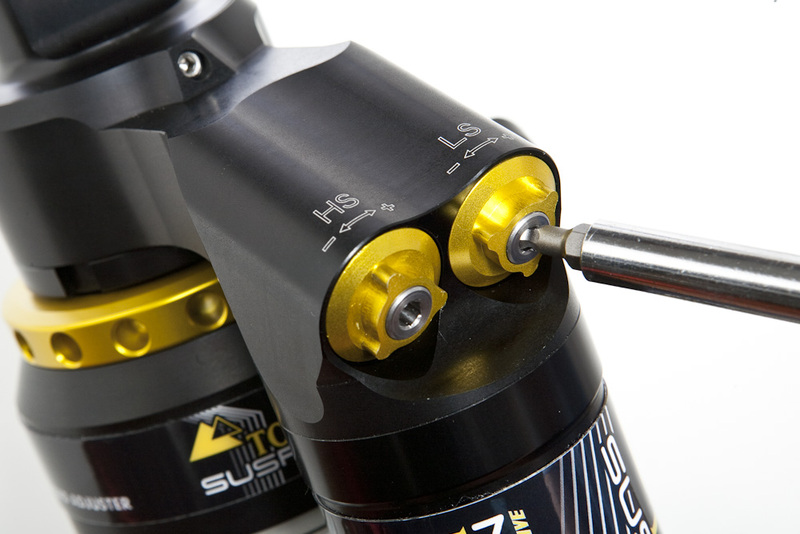 This adjustment changes the oil resistance in the shock for large suspension movements. The low-speed adjustment can be used to change how much travel the bike uses to absorb rolling bumps, water bars, G-outs, or jump landings. If you feel that the bike is using too much suspension travel or bottoming out when you jump or ride over rolling bumps then increase the LOW-SPEED compression by turning the screw a few clicks clockwise. If you feel that the suspension is not moving enough to absorb larger bumps and is transmitting too much shock to the rider, then reduce the LOW-SPEED compression by turning the screw a few clicks counterclockwise. 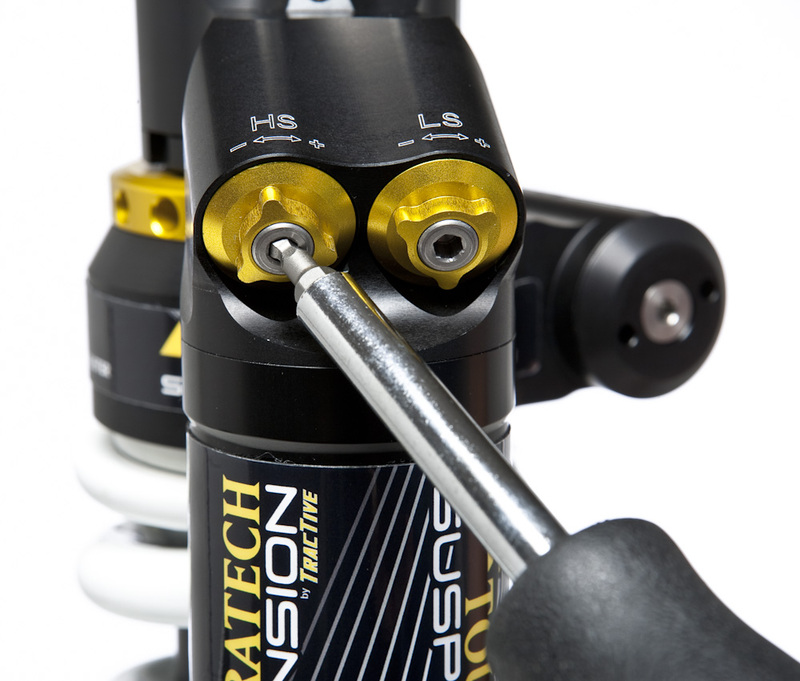 You can adjust the length of the shock by loosening the lock nut and spinning the lower mount to make it longer or shorter. This adjustment can be used to change the way the bike handles. By increasing the length of the rear shock, the bike will turn more quickly and carry more weight on the front tire. Decreasing the length of the rear shock will increase the rake angle of the front end of the bike, slowing the steering and carrying more weight on the rear tire. 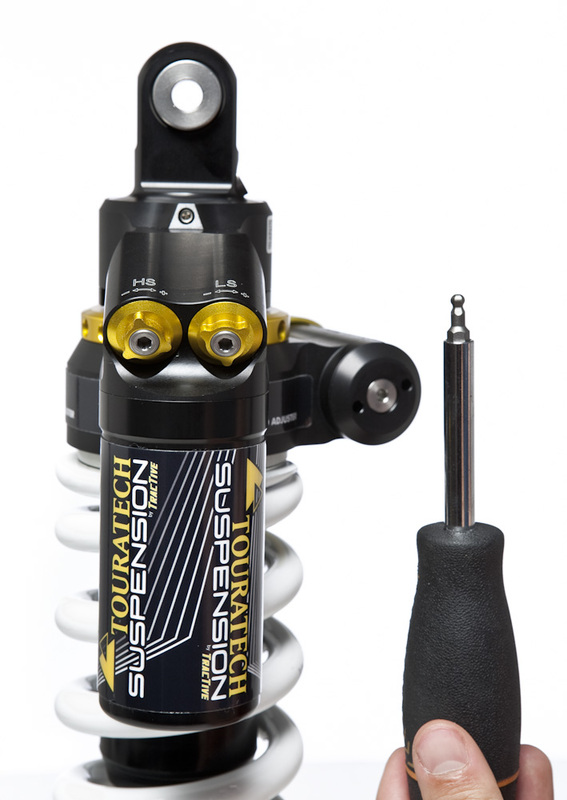 Click HERE to see the complete line of Touratech Suspension.